If you’re one of the many thousands of cat or dog owners in the UK, you may feel that carpets may not be the best choice for your home. True, pets can make a mess but that doesn’t mean you have to forego the pleasures of a carpeted home and settle for hard flooring. It just means that you should think more carefully about the type of carpet you have fitted, and how to look after it properly. Loop pile carpet consists of loops of yarn to create a curved finish. They’re generally considered the most hard wearing of all the carpet types. 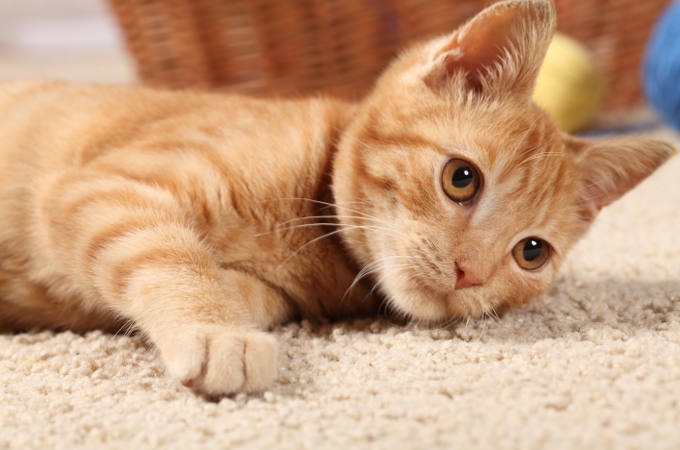 Unfortunately, loop pile carpet is not suitable for homes with cats or dogs since animal claws can easily get stuck in the loops, resulting in a torn carpet or even a torn claw – not a happy outcome. What’s more, many pets love the idea of pulling up carpet loops, meaning your carpet will be ruined in no time. Cut pile carpet is made by cutting the yarn to produce an upright pile, giving a more luxurious, formal look than loop pile. If you have a cat or dog, choosing cut pile carpet is the sensible answer. Stains from muddy paws, pet accidents or ‘presents’ brought in from outside are one of the biggest concerns pet owners have about fitting carpets in their home. Wool carpets are particularly sensitive and may not work if you have a pet. Luckily, manufacturing technology has come on in leaps and bounds so there are good alternatives to natural fibres that can withstand heavy wear and tear from pets and their owners. 100% polypropylene carpets have built in resistance to dust, dirt and liquid spills – the stain will sit on top of the carpet pile instead of penetrating. Ideal for pet owners, this type of carpet is best for stain resistance. It will come as no surprise to hear that, say, a plain cream carpet will show up every tiny bit of hair, dust or general soiling, leaving you with a lot of worry and work to keep it looking clean. Darker coloured carpets or patterned carpets, on the other hand, are much more forgiving. The way you use colour or pattern on the floor can have a big effect on the durability of your carpet. For a genius solution to ‘hide’ the dirt, why not try to broadly match the colour of your carpet to your pet’s fur? However pet friendly our carpet may be, meticulous hygiene will be required if you have a pet in the house. This includes daily hoovering to make sure no pet hairs or dirt are being ground into the carpet fibres. It goes without saying that any spills or accidents should be cleaned up as quickly as possible to minimise the risk of any staining or lingering odours. Regular professional carpet cleaning is highly recommended to maintain maximum levels of cleanliness. At Apple Clean we offer an additional stain removal service to tackle persistent stains including food, urine and vomit. For more information about your carpet cleaning requirements, please don’t hesitate to contact Apple Clean on 0800 5874571 today.